Children walk by houses destroyed by on-going fighting after their first day of school in eastern Aleppo, Syria. 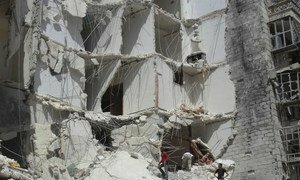 The United Nations humanitarian envoy for Syria today urged actions to stave off the threat of mass hunger in eastern Aleppo before the arrival of winter that he fears could be “a real killer” for a quarter of a million people trapped there. “None of the four elements are conditional on the others,” he said.“Having heard back from the [humanitarian] taskforce today, we are hopeful that both sides will, since the situation is so horrendous as it is, grant us the opportunity to both come with supplies into east Aleppo, and evacuate wounded and others out of east Aleppo,” he said.